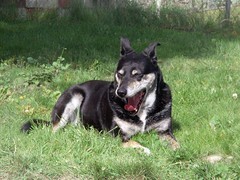 Tica yawning in the hot sun. Photo by Melissa. We aren’t walking much this weekend. Tica is zonked from the heat and freaked by the fireworks. She wants to go out, but pulls strongly towards home as soon as she hears a crack, snapple, or pop. Often, she’ll be too afraid to even potty. I have to be watchful and remember to let her in the backyard when it’s quiet. If you have dogs (or cats), remember that they need extra consideration over the next few weeks. Many animals react very strongly to fireworks, thunder, and other loud noises. My cats don’t seem to mind fireworks as much as Tica, but all of us suffer when the Blue Angels are practicing. The cats hide under the bed and are out of sorts. Speaking of kitties–I’ve posted several snapshots of cats we notice on our walks to the Beacon Hill Blog flickr group. If you have a BeHi feline, post your pictures to the group.